Sustainability has always been at the heart of our philosophy, ever since the inception and foundation of Italian Special Occasions DMC (ISO). In our articles we often mention the importance of sustainable tourism for the conservation of resources and the environment, and for increasing the value of local culture and tradition. But what are we at ISO doing exactly to work towards a more sustainable tourism? 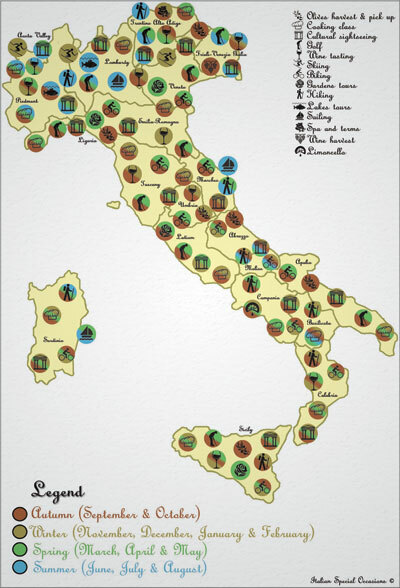 A couple of years ago we launched the Seasonality Movement for a more educated tourism, accompanied by a map to illustrate the idea with an infographic. Embracing our new concept of seasonality means travelling in off-peak seasons, or even in the high season but enjoying those activities that are typical of the period, and not dictated by mass tourism. Different seasons are ideal for visiting different regions, and you can find the best region-season combination thanks to our insider local knowledge. This type of travel promotes sustainable tourism, as there is less demand and stress over local resources. Furthermore, locals get to work with a constant flow throughout the year, and not only during high season. Therefore, this brings benefits to the local environment and to the socio-economic balance of the community. It probably also means cheaper travel conditions for you, as there is less demand. Successful sustainable tourism is possible if hospitality properties and local suppliers also do their part in helping the natural, cultural and economic environment of a territory. At ISO we work with a selection of carefully hand-picked properties. One of the most important criteria for selection, apart from the unique styles that embrace the history and tradition of the destination, is the property’s eco-friendly approach to tourism and business. We value highly those hotels, ancient palaces, stately villas and rustic farmhouses that use solar panels and renewable water systems; that serve seasonal produce from organic fields and synergistic vegetable gardens; and that help local entities in the promotion of cultural, artisanal and food events. At ISO we also appreciate our partnerships with selected local suppliers, looking for a shared respect for the environment, art, culture and traditions. Examples are transport services engaged in reducing their carbon footprint; local tour guides who promote the use of bicycles and sailboats; and cooking schools that use organic seasonal products. Italian Special Occasions DMC, in collaboration with its partner Studiainitalia, is developing a new project called Creative Italy. It is dedicated to embracing and safeguarding ancient crafts, allowing travellers to interact with artisans, to put their creativity and skills to the test, and to experience authenticity in a whole new way. Why? Craftsmanship has always played an important role in Italy’s history, economy and social fabric, making it a rich Nation in terms of creativity, inspiration and high-level artistic skills. Every region has its own typical activities with century-old traditions, handed down from generation to generation. The variety of manual crafts is simply amazing, but often ignored and underestimated by many in today’s world, who prefer to embrace consumerism. We firmly believe that artisans are the custodians of these ancient traditions and professional techniques; and that it is important to protect and value their ancient arts. We as a society should not forget our origins, and by protecting our historic heritage we can become ever more creative, skillful and respectful of the environment and cultures. It is yet another step towards achieving sustainable tourism! 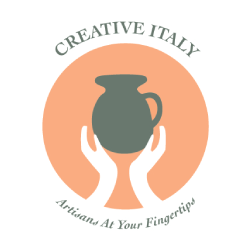 Creative Italy will be launched in early 2017. Meanwhile, stay tuned on “Be Inspired Blog” for more tips and ideas for seasonal travel and authentic activities!